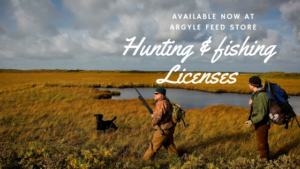 Did you know you can pick up your 2018-2019 Hunting and Fishing licenses at Argyle Feed Store? Skip the big box stores and shop local. Save time and find all your hunting and fishing supplies at Argyle Feed Store. Either the saltwater endorsement (with a red drum tag), freshwater endorsement, or both. Residents who purchase “Combo” packages specific to either salt or freshwater fishing may upgrade to the “All-Water” package by purchasing the additional endorsement not included in the initial package they purchased. Senior Combo license packages are available for residents age 65 and over. This entry was posted on Tuesday, August 22nd, 2017 at 7:54 pm	and is filed under News & Updates. You can follow any responses to this entry through the RSS 2.0 feed. Both comments and pings are currently closed.